State of California Travel and Tourism. "This land that once knew the glory of prosperous vineyards, orange groves, silver mines and oil fields today encompasses a sweeping metropolis filled with people of diverse backgrounds who share a common pride in this region and a sense of accomplishment in realizing their dreams. " "Visitors have enjoyed Bakersfield's hospitality since the mid-1800's when the community's founder, Colonel Thomas Baker, set aside a portion of his land as a resting place for weary travelers and their animals. " "A Lovely Place to Visit. A lot to do and see." "Rodeo Drive entices the world's hippest and most charismatic personalities to experience the ultimate shopping fantasy. The three hallowed blocks that encompass Rodeo Drive have more to offer than ever before." "As Southern California's premier vacation and recreation area. Big Bear Lake offers a world of natural beauty, crisp clean alpine air and four-seasons of recreation. " "your source of information on the Bodega Bay Area Serving Bodega Bay, Bodega, Valley Ford, Freestone, Occidental"
"Buena Park is the attraction and entertainment capital of Southern California -- visit us and find out why!" "Have you really been here?" "Take a virtual tour of the island. Calendar of events for Two Harbors. "discover the visual arts and galleries, as well as performing arts, that abound in Chico." " Where the Vineyards meet the Redwoods . . . . "
"Chart a course to an enchanted island! " "Prepare yourself for something special . . . a trip right into the heart and soul of California. Fresno! A place where reverberant and colorful contrasts abound." "Laguna Beach is a recreational mecca for surfing, swimming, diving, tennis, golf, fishing and sailing. With gentle sea breezes and some of the world's cleanest air, beaches and water, Laguna Beach offers a variety of year-round watersports and ideal weather for hiking, biking, walking or just strolling through the village. " no matter what time of the year you choose to visit Long Beach, there's always a special event in store. From the city's legendary Naples Island Boat Parade at Christmas to the popular Long Beach Museum of Art Summer Concert Series, there's something for everyone." Calendar of events. --- Off line as of last check April 4, 1998. "Mammoth Lakes is the center of a vast alpine region offering visitors a complete mountain resort experience full of outdoor adventure in every season." "With over 300 days of sunshine per year, Mariposa County's climate offers four seasons of get-a-way satisfaction AND is the ideal central location for all of your recreational pursuits." ""blessed with an abundance of natural resources, is recognized as one of the richest and most beautiful counties in the nation, and we are proud to share it with visitors from all over the world. There are many wonderful ways to explore Marin. The magic begins with spectacular views as you head north across the Golden Gate Bridge or arrive by ferry into the cities of Larkspur, Sausalito and Tiburon. Visit the Golden Gate National Recreation Area, Muir Woods National Monument and Point Reyes National Seashore to experience wildlife and open space that has been preserved for future generations." "Have you really been here? AGAIN?" "Today the valley's beauty is undiminished, the wines are better than ever, and so is the variety of activities the valley has to offer. Winery tours and wine tasting are perennial favorites with valley visitors, but there's much more. Fine dining, tours by balloon or train, shopping, golf, spas, glider rides and art galleries - Napa Valley has truly something for everyone. " "Newport Beach is located along the beautiful Pacific Ocean in Orange County,California, nestled south of Los Angeles, north of San Diego and southwest of Disneyland in Anaheim, adjacent to John Wayne/Orange County Airport. Our Mediterranean climate of balmy days and cool evenings provides a perfect year-round backdrop for a refreshing vacation, successful business conference or family outing. We invite you to share in the beauty of our city and all it has to offer. Surrounded by one of the largest small-boat harbors in the world and lazily stretching itself along more than six miles of scenic Pacific coastline, Newport Beach beckons national and international visitors to moor at our magnificent harbor or lodge at any of our world-class hotels. Once you arrive, you'll soon discover why we call Newport Beach "The Colorful Coast." "
"Spanish explorers first entered the area that is now Oakland by land on March 27, 1772. They reported the natural geography as possibly the most perfect on earth. Near the shore were stands of magnificent oaks; on the hills stood acres of giant redwoods.In the spring, wildflowers filled the valley with golden poppies and purple iris. Deer, rabbit, bear and wildcat roamed the woods. Creeks tumbled into a Bay filled with salmon, crab, sturgeon, smelt, lobsters, clams and mussels. "The official site, but the one above is better for tourist." "A rails-to-trails conversion of the 100 year-old railroad line that hauled trainloads of oranges from local orchards to markets around the world. Links Ojai to Ventura's Foster Park 9 miles to the south. For walkers, joggers, cyclists, equestrians." "The view from the Dennison Grade as seen by Ronald Coleman in the 1937 film classic "Lost Horizon." Follow Highway 150 east toward the Upper Ojai Valley, and stop at this vista point for an awesome sight." Calendar of events can be reached easily through their home page. "Ontario is one of California's first planned communities. Known as 'The Model Colony'." Calendar of events. <-- being revamped. April 4, 1998. "Our friendliness and vitality will surprise you . . . the beauty of our surroundings will awaken you. Curling waves will crash and glisten in the sun, and you'll trace new steps in the sands of history." "Conde Nast Magazine calls Palm Springs "the hippest destination in America." Some locals call it "a cruise ship that never docks." It's an oasis in the Southern California desert, surrounded by spectacular mountains, bathed in sunshine and clean air, sparkling with flowers, golf courses and lots more..."
"Check out what the resorts have to offer!" "A world apart, yet just a short 30 minute drive to downtown Los Angeles and within an hour's drive to all major attractions, Pasadena is a perfect base for a week of exploring Southern California." " Few cities of our size in America have earned the reputation that Petaluma can claim. We have gone from being one of California's largest cities (1860's) to the World's Egg Basket (early 1900's) to the World's Wristwresting Capitol(current)." "Northern California's Golden Wine Region." "The new, $10,000,000, pier is something to see. Connecting the pleasure pier with the International Boardwalk, the new pier replaced the one destroyed in the terrible fire of 1988. When replacing The Pier the City built a new fishing area where fishermen, fisherwomen and kids can cast their bait into the famous Redondo Canyon. The new Redondo Horseshoe Pier is a short walk from all Harbor Hotels and there is ample parking if you drive. This area is a must see for all visitors and residents alike." "Metropolitan amenities with small town affordability... dozens of natural and man made attractions... and the most consistent great weather in North America. Welcome to Ridgecrest, California, the perfect oasis for your next vacation! Home to Death Valley." "Volunteers are in the office most days and can help you find accomodations or plan an afternoon of beach combing, Gray Whale, Sea Lion, or bird watching. or provide information about dining, canoeing,swimming, biking, hiking, shopping, getting a massage, renting a video, going fishing, riding a horse, playing golf, taking a hot air balloon ride or finding some night life. Whatever your interests, we hope your time in our area generates good memories." "A big-time city with a small town flavor, Sacramento is a destination of delightful contrasts." sactorama.com is a new local portal for the Sacramento area. "San Diego is a perfect vacation getaway, whether you've planned just a weekend escape or a leisurely stay. There's so much to see and do in San Diego that it will take you more than just one weekend to explore it all." "The Capital of Silicon Valley. Nearly 300 sunny days a year." "A warm and friendly vacation destination just halfway between Los Angeles and San Francisco. Highlights of the county include Hearst Castle, over 35 wineries, and uncrowded beaches and unmatched scenic beauty. Our unique small town charm is found in Atascadero, Avila Beach, Cambria, Cayucos, Grover Beach, Morro Bay, Paso Robles, San Luis Obispo, San Simeon, Templeton, and other South County treasures." "The Best of the San Francisco Peninsula." "A sunny California paradise with towering peaks and whitesand beaches. When people think of the Riviera, they generally think of the European Riviera - a spectacular, narrow coastal strip that stretches along the Mediterranean Sea from France and Monaco to the northern shores of Italy. But on the other side of the world, on the shores of the beautiful Pacific Ocean, lies an American Riviera - Santa Barbara, California." "Santa Clara is Silicon Valley Central." "Welcome to Santa Cruz County! Bordered by magnificent coastal redwoods on one side and the Monterey Bay National Marine Sanctuary on the other, Santa Cruz County is noted for its 29 miles of beaches and a climate that boasts 300 sunny days a year. Sunset magazine recently named Santa Cruz the "Best Beach Town" in Northern California!" "Welcome to Santa Monica California -- where the sun shines nearly 300 days a year! A community by the sea. " "In the northeast corner of California lies one of the country's most beautiful regions - the Shasta Cascade. Unspoiled, breathtaking vistas enthrall visitors with towering mountains, volcanoes, glaciers, waterfalls, whitewater rivers, dense lush forests, and glistening lakes. The region boasts seven national forests, several national and state parks, the Trinity Alps and the California Cascade range - including two giant glaciated volcanoes, the dormant 14,162 foot Mt. Shasta and the still active 10,457 foot Lassen Peak." Central Sierras and Calendar of Events. 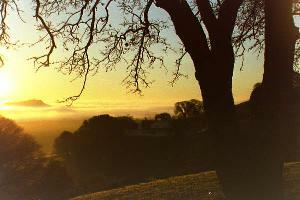 Sierra Foothills and Calendar of Events. Yosemity Sierras and Calendar of Events. "Welcome! Velkommen! to Solvang, CA. Danish capital of America. No passport needed to visit sunny Solvang or outlying areas of Ballard, Buellton, Lompoc, Los Olivos, Los Alamos and Santa Ynez." "Just one hour north of the San Francisco and the Golden Gate Bridge is a land that offers visitors more award-winning wineries than any other viticulture region in the United States, Redwood forests, 76 miles of handsome Pacific Coast beaches (complete with a fishing village), a restored Russian Colony outpost at Fort Ross, self-guided tours of farms that offer everything from goat cheese to horse and wagon rides, and much more." ""Gateway to the Delta" where you can enjoy over 1,000 miles of waterways in the Delta region. The Delta offers all sorts of recreational activities, from houseboats to jet skis, along with an abundance of fine striped Bass fishing." Comprehensive Guide To Lake Tahoe Activities! "There's something for everyone at Lake Tahoe South Shore." "Home of Marine World Africa USA." "on California's beautiful coastline, just an hour north of Los Angeles."